I’m writing this blog for everybody else with this disease. I hope it may help; it may not, but I’m guessing it will be quite cathartic for me to finally write about it. I was diagnosed with hypothyroid disease in 2003. The reason I went to the doctors was because I was so tired all the time. It just didn’t make sense – the kids were by now both at school, and I didn’t have a stressful job, yet I still needed to have a sleep in the afternoon and I struggled to get the energy to do the hoovering. I remember the appointment very well, and I’m afraid I’m still bitter now. I was made to feel so small and unworthy of the doctor’s time. At that point I thought I may have hepatitis C; I’d heard that people could live with it without knowing for ages, and the only symptom was feeling extra tired. I’d had a dodgy result of a blood test after a blood transfusion a few years before – a re-test came back negative, but it still played on my mind. Anyway, I stuck to my guns and insisted the doctor do a blood test; which she did, including one for hypothyroid disease, but she made it clear she thought it was just my lifestyle – sitting on the settee writing all day – which made me feel tired. She told me all I probably needed to do was to stop the typing in the evenings and relax properly so that I slept better at night. About a week after that I had a phone call from a different doctor telling me that the results showed I had borderline hypothyroid disease and made an appointment to come in. I researched all about it on the internet, and just as well that I did as the explanation at the doctors’ lasted all of 2 minutes. Hypothyroidism is an autoimmune disease (one of the ones where the body thinks it’s being attacked when it isn’t) that slows down the thyroid gland. They gave me 25mcg of thyroxine and told me to come back in 6 months. 25mcg!!! What a joke! I spent those 6 months waiting and waiting for the thyroxine to kick in and it never did. At 6 months my results hadn’t changed, so they upped the dose to 50mcg and was told to come back in another 6 months. That year was the worst year of my life. I look back and I think that my children should have been taken into care and I should have been given intensive therapy. Being tired should never be underrated. I was a nightmare and the worst of it was that I always got the most tired at 4pm, just after getting home with the kids. I just hope they were young enough for that year not to stick in their memory too much. I was either collapsed on the settee with instructions for them to ‘get on with it’ in their bedrooms, or getting cross with them because they’d had enough of being ignored and quite rightly wanted my attention. After a year my blood tests had only got marginally better and I didn’t feel better at all, so they said I could see the specialist, Dr Barnes at the Kent and Sussex hospital. I was on the waiting list for a year – so if you’ve been diagnosed, but don’t feel any better, then insist your GP refers you to a specialist as soon as possible. Meanwhile, I had another year on only 50mcg. During the first year I had put on a stone in weight, without eating more than 1700 calories a day. In fact, for 4 months I didn’t eat more than 1000 calories a day because I was a bridesmaid for my sister and the other one was a size 4. It didn’t make sense at all, but of course when you tell that to a doctor, they’re polite, but look at you with eyes that tell you that they don’t believe you for a second. So the second year, I took up kickboxing. I started with one one-hour lesson a week, but this quickly increased to three classes a week – two of them being an hour-and-a-half. This I think did help a bit with energy, and I enjoyed it, but I still managed to put on another stone in weight. By the time I saw the specialist it was too late. I enjoy food; I’ve never been skinny – that’s simply not my build and I was fine with that – but I really really struggled with all the dieting for those two years only to have the opposite effect. This is where I may get a bit whiny and whingey and if I do I’m sorry. It’s depressing having no control over your body. And when I get depressed I eat. What’s the point in dieting anyway when it doesn’t help at all? It got to the point where I thought about food all the time whereas before I wasn’t all that bothered about it really. The other major problem is that the symptoms of being hungry -I get dizzy, I feel sick and I get headaches; are the same as feeling tired. Not helpful; and food gives you energy doesn’t it? So I probably spent the third year being depressed and giving up. I kept up the kickboxing though, but I continued to put on weight. After the bouts of depression I felt guilty – after all, as diseases go, this one isn’t a particularly bad one and there are many many more people dealing with illnesses far more serious than my own. I had to come to terms with how vain I turned out to be. I hated what my body had turned into; I literally became embarrassed of myself and would avoid seeing anyone as much as possible; dropping the kids off early to school and arriving to the playground as late as possible in the afternoon. In the grand scheme of things I know it’s stupid; after all on the inside I’m still the same person and how important are looks anyway? Easier to say that than believe it though, and it doesn’t help when I’m given pudding portions half the size of everyone else at the table and people go on about how much weight they’ve managed to lose. Nor does it help when people tell me I could live on water and vitamin tablets and I wouldn’t die – I’d just lose weight. The main other symptom I’ve had to deal with is forgetfulness. During the first years when I wasn’t given enough thyroid replacement, I could walk into the kitchen to get a pen and sit down empty handed with a notebook in my hand about 4 times in a row before I actually managed to remember to pick up a pen. There have been many moments of embarrassment when I have forgotten people’s names even though I’ve known them for years. On the plus side, this is the main thing that has improved with treatment. I’ve also now got dry sensitive skin, which I never used to have, and weirdly this has got worse over time. In terms of treatment, I’ll carry on where I left off. After seeing Dr Barnes, I had blood tests every 3 months instead of 6, and throughout the fourth year, my thyroid dose gradually increased until I was taking 150mcg and 125mcg of thyroxine on alternate days. Then he added 20mg of liothyronine – which is T3. (Usually the T4, which is the thyroxine, converts to the T3) Dr Barnes said it would be worth a a try and as I’d read on the internet that I should insist on the liothyronine, I was very glad to have it. I certainly felt better, but I was still putting on weight and needing a sleep most afternoons. In the fourth year, he gave me Armour thyroid. This is natural thyroid; which means it is the dessicated and put into pill-form of thyroid taken as a by-product of farmed pigs and contains both T4 and T3. I gather that it is very unusual to be given it; it is not fully approved in Britain and has to be bought from America; but I’m very glad I was. 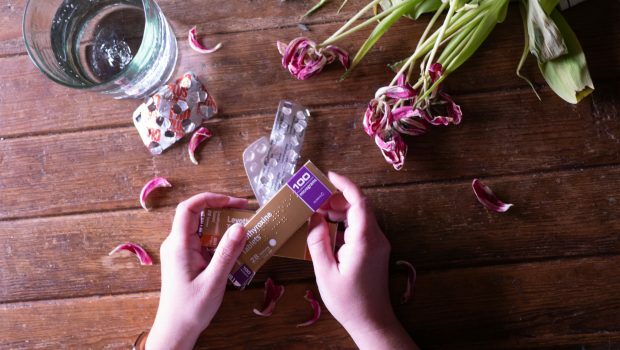 Unfortunately it’s difficult to measure the effectiveness of these pills and I’ve found widely conflicting conversion charts from one form of thyroid to the other, so once again, I had to start at a lower dose and gradually increase it over time. Eventually, in the fifth year I stuck at 3 grains one day and two and a half the next. At this point a couple of my blood tests showed I was slightly over prescribed, but Dr Barnes took how I actually felt into account and luckily didn’t decrease the dose. I’ve never had symptoms related to too much thyroid. I stayed at this for about three years and felt the best I had for some time. There were still frustrations – days when I had lots planned, but just couldn’t manage it. I still got depressed about that and about my weight. I was sent to a nutritionist at Pembury Hospital who told me nothing I didn’t know already and was a complete waste of time. 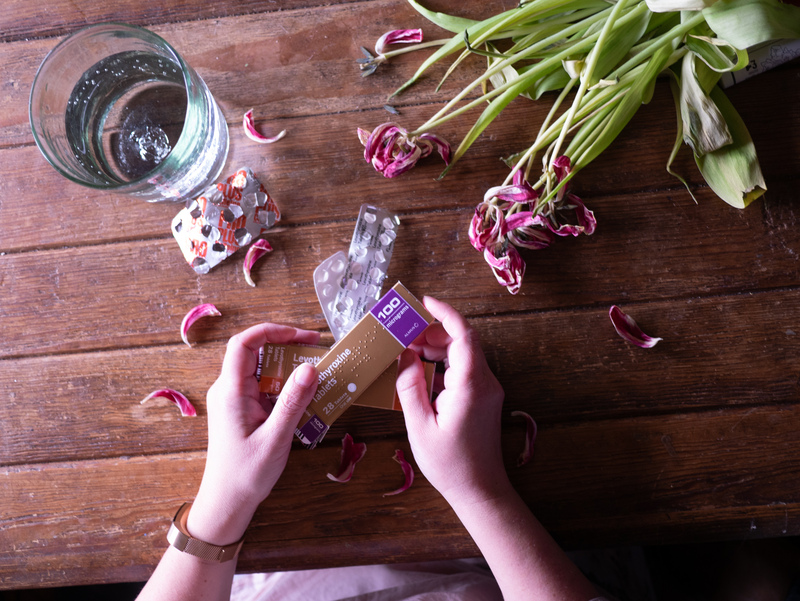 My GP tried two different types of diet pills – first appetite suppressants; sibutramine. They worked, but although I ate less I never lost more than 5 pounds. Then they tried Orlistat. Since then this has become available without prescription under the brand name of Alli. This works by preventing much of the absorption of fat. This is fine if you eat fat, but I didn’t! At least not from Monday – Thursday, when it would make me constipated. Then at the weekend when I allowed myself treats; the pills did their job and got things moving! (Sorry!) So it meant I would put on weight during the week when I ate healthily, and then lose it when I ate unhealthily at the weekend. Ridiculous! And ultimately meant I didn’t lose a thing. By that time I’d found a sympathetic doctor who seemed to actually believe me when I showed her my food and exercise diaries, but she had no ideas left. Since then I just get tutted at at the yearly nurse check-ups for the pill. Things carried on without much change for the last couple of years until about 5 months ago when America ran out of Armour thyroid. I kept having relapses of tiredness while I waited for weeks for the pills to come in, until they stopped coming in altogether. This is when I came up against my new doctors in Somerset. They had never heard of Armour Thyroid, but were happy to keep prescribing it after a phone call to Dr Barnes back in Kent. But after they ran out, I had some difficulties. The only solution was to go back onto thyroxine, but the two doctors I spoke to on the phone suggested starting on 25mcg again. I nearly burst into tears on the phone and begged to be referred to a specialist here, but they wouldn’t. Fortunately I found an old letter showing how much I had been given, and they gave me 100 mcg. They refused to give me more than that. I phoned Dr Barnes for his opinion, which I passed on to my usual GP in Shepton Mallet, who had (thank God) got back from his holiday and at least knew something about my condition. He took my word for what Dr Barnes said to me (I’m glad he did, but isn’t that a bit risky?) and on his advice kept me on 100mcg of thyroxine, but also gave me 20mcg of liothyronine per day. After three months on this I felt ok and the blood test came back within normal limits. My next test is in 6 months. I feel reasonable, though I still get tired easily and still haven’t lost much weight. At my worst I put on 4 stone, 11 pounds since 2004. I’ve recently lost 5 pounds, but the only way I can do this is by eating no more than 750 calories a day and even then I only lose 1 or 2 pounds a week. I am constantly hungry and find it extremely difficult to keep going and as soon as I stop, the weight piles back on quicker than I can say ‘melt-in-the-middle-chocolate-pudding’. I am determined to keep going this time though. I’m dreadfully sorry I couldn’t be more positive for any readers who have recently been diagnosed with hypothyroid disease. Most of the time people’s experiences are much easier – they are given the usual dose from their GP and quickly get better. I don’t want to make you feel bad, but I want you to learn from my experiences and take my advice. If you’re one of us who don’t feel better, then insist on seeing a specialist. I think I was relatively lucky that this was quite painless in Tonbridge. Fortunately, I don’t feel too bad at the moment, but the doctors at The Park Medical Practice asked me what would be the point of seeing a specialist? I was so flabbergasted by the question, I couldn’t think of the words to answer! Now the words come to me: ‘Because none of you have a clue what Hypothyroid disease is about and I deserve to see someone who does.’ I’ll be ready next time. Everyone at The Park hadn’t heard of Armour thyroid or even liothyronine and even after the last blood test, I had to insist on continuing with it. So if you have an incling that your own research into the disease exceeds the knowledge of your GP, insist straight away that you see a specialist. Kick, scream, shout and jump up and down if you have to; and keep seeing different doctors until they help you properly. This is your health and the way it affects your life and is important. In the last year I’ve started taking pro-plus pills. These are the only energy pills that only have caffeine and not also glucose – which is sugar. For me they have been a god-send and I usually take one dose every day; occasionally two. This is equivalent to one cup of tea and I don’t drink tea or coffee so I feel it’s ok. I can’t advise it though because caffeine is supposed to make hypothyroidism worse. By how much I don’t know, and I doubt the experts do either, but I took the decision that I’d rather spend a shorter life awake than a longer one asleep. If you suffer from dry sensitive skin, then I recommend ‘Simple’ moisturiser and ‘Witch Doctor’ cleanser for the face. I think Nivea do a really good body lotion. When you have your blood tests make sure they are testing Free T4 and Free T3 as well as the TSH result so they can see whether everything is converting from one to the other all right. Also, whilst it is good to start low and work up (I’ve met some people who were put on a high dose straight away and felt terrible – especially with palpitations in the heart), ask for initial blood tests to be every three months, not six, so you can get on your correct dose quicker. Lastly, if anyone wants to share their experiences, please do so by adding your comment here. Whenever I’ve talked to people who have the same disease, I’ve found it so interesting to compare treatment and symptoms etc. I watched back the September Favourites You Tube video I made, and I don’t think my tone of voice was sarcastic enough when I said that next time I’d be in the bedroom with a white headboard with fairy-lights and a vase of flowers and candle in the background! (This seems to be the setting of 99% of monthly favourites You Tube videos.) 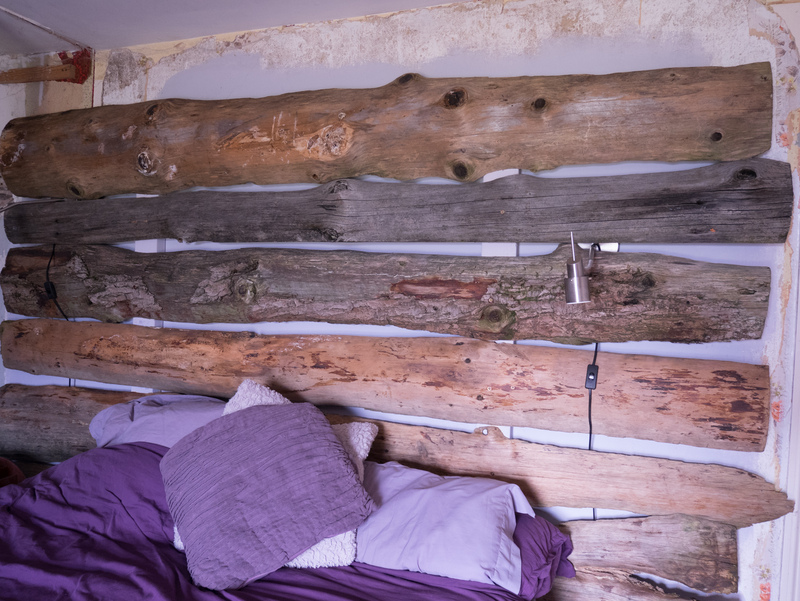 When I made that video we had no headboard at all; flaky plaster; holes in the ceiling and a lot of mess. Last weekend though, we got busy in the bedroom(!)….. Twin Peaks The Return. Televisual genius or a load of sh*te? A review at the half way point. 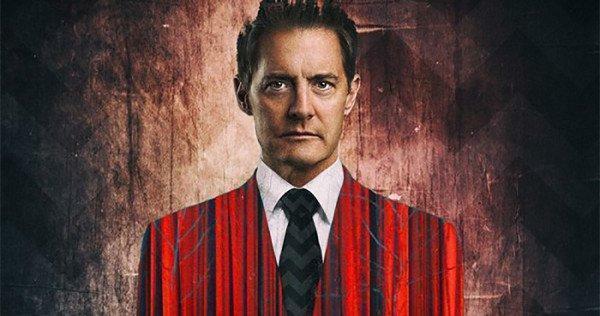 I was looking forward to this new series of Twin Peaks so much. Maybe too much. Maybe it just brought back happy memories of teenage-hood that I wanted to recapture – or something like that. At the very least I wanted a decent television series that I would enjoy watching. Instead; we got this….. The Beauty Bargain you need to know about today! 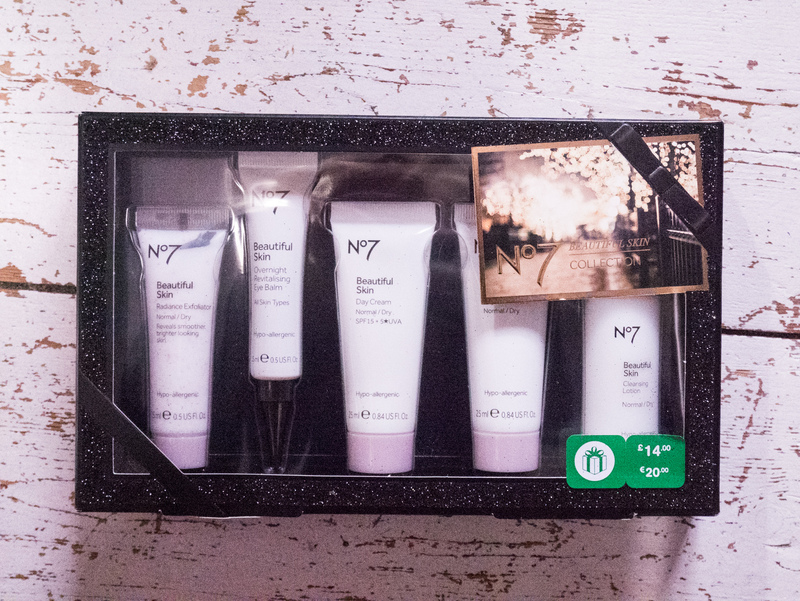 I am a fan of Boots No 7 beauty products – on the whole they work very well for my skin, so I was pleased to spot this gift pack in the Boots January sale called the No 7 Beautiful Skin Collection. Originally £14, it’s now half price at £7, which makes this a real bargain. It contains small size tubes and bottles of Radiance Exfoliator; Day Cream; Night Cream and Cleansing Lotion. But the main one to note is the full size bottle of Overnight Revitalising Eye Balm. The same size retails normally at £12, so if this is a product you’re likely to use, then the whole pack is an absolute steal. I’ve just bought two packs! My local Boots had stacks the other day, but only a few today, so get out quick to grab this while you can! Or I’ve just found it online. On a side note, they’re also doing a three for two on Boots No 7 beauty products in their usual price range at the moment and you’ve got one more day to use the £5 off beauty products and £3 off make-up vouchers they’re handing out at the till. (You’d have to work out if the three for two is better value as you can’t use both offers at the same time.) So there you are – just a very quick beauty tip I thought you might like to know about! Rain kindly bought this book for me for Mothers’ Day, and I’ve since managed to fit in the odd five minutes here and there to read it. That’s one good thing about Things Are What You Make Of Them – it doesn’t take long to read! Oh that makes me sound like I don’t like it, which isn’t true. It’s a book for the current generation who take their entertainment and information in snippets; in bite-size chunks of Instagram stories. 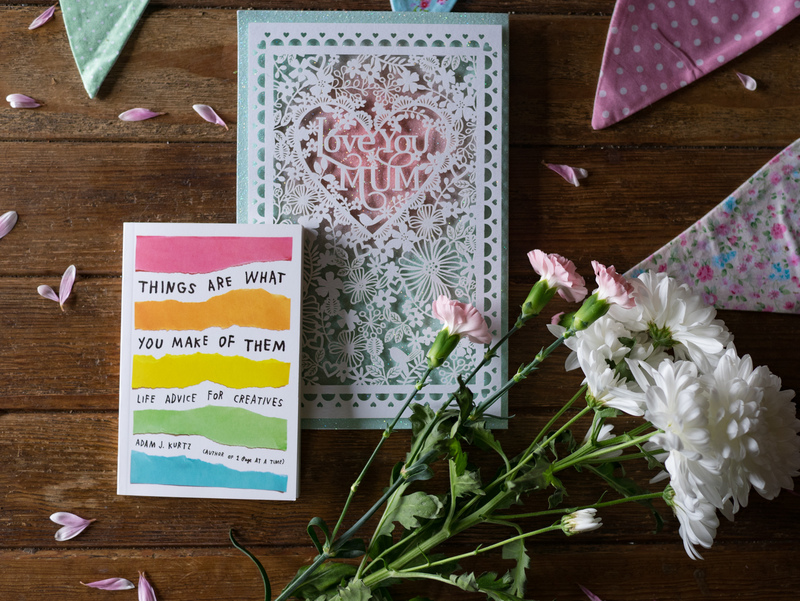 There are even perforated edges so you can choose your favourite little pages of words of wisdom to put up on your copper magnet board next to the foiled print that says Eat Sleep Create…. The rain and being old!